The marker is located in the Riverside Cemetery, Wichita Falls, Texas. From the entrance of the cemetery, go straight, then turn right at the third lane, then turn left at the first lane. The J A Kemp marker stands about forty yards in front of the Burnside marker. GPS 33-degrees 54' 43.3" N 98-degrees 30' 25.5" W.
For more information about J. A. Kemp published at the Handbook of Texas Online, click the button below. 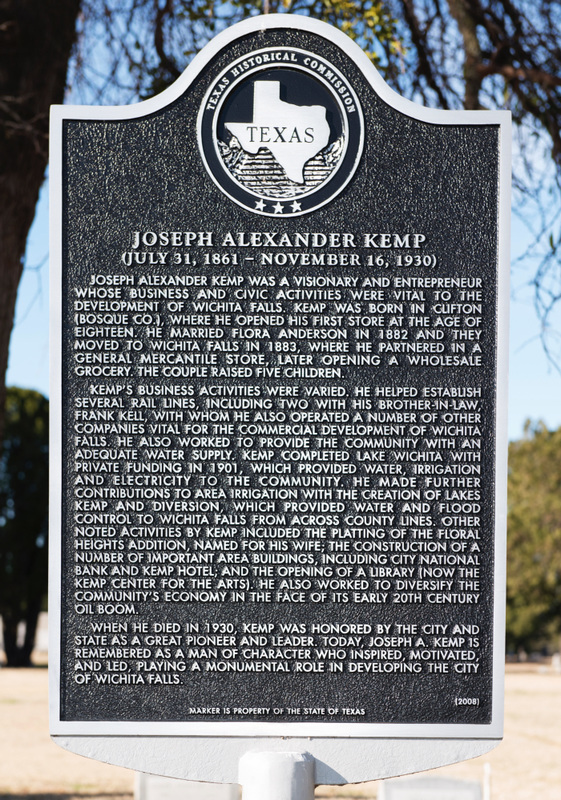 Joseph Alexander Kemp was a visionary and entrepreneur whose business and civic activities were vital to the development of Wichita Falls. Kemp was born in Clifton (Bosque Co..), where he opened his first store at the age of eighteen. He married Flora Anderson in 1882 and they moved to Wichita Falls in 1883, where he partnered in a general mercantile store, later opening a wholesale grocery. The couple raised five children. Kemp's business activities were varied. He helped establish several rail lines, including two with his brother-in-law, Frank Kell, with whom he also operated a number of other companies vital for the commercial development of Wichita Falls. He also worked to provide the community with an adequate water supply. Kemp completed Lake Wichita with private funding in 1901, which provided water and flood control to Wichita Falls from across county lines. Other noted activities by Kemp included the platting o fate Floral Height addition, named for his wife; the construction of a number of are buildings, including City National Bank and Kemp Hotel; and the opening of a library (now the Kemp Center for the Arts). He also worked to diversify the community's economy in the face of its early 20th century oil boom.